//If the function needs recursion it applies itself over a subset of the original params. There are two kinds of recursion depending on what they recur on. If the recursion takes place over elements contained in the input of the function it is call Structure recursion. You can see this recursion as a way of iteration (usually over nested structures). One example of this recursion is in a recursive version of the binary search algorithm. This algorithm works on a sorted array. Every step we take the element in the middle of the array and we compare it with the one we are searching.If the number is smaller that the one in the array we take the first half of the array. If it is bigger we take the second half. The half has to be passed again to the function till we found the element or the array gets empty. The array presented in each step is a part of the original array. This kind of recursion helps to traverse nested structures or algorithms. Other examples could be the recursive function length wich stops recuring when the array is empty or any branch-leaf traversing function. Generative recursion is when the data recurred on is not contained in the array. Although this data usually depends on the original but it is not a requisite. As you can see the the recured data is not part of the original input. 4 is not part of 5. It’s new data. This kind of recursion opens a door for more expressive programming. Letting us define abstract processes easily. The nature of generative recursion let us ignore some part of the structure or the original data for improving performance. 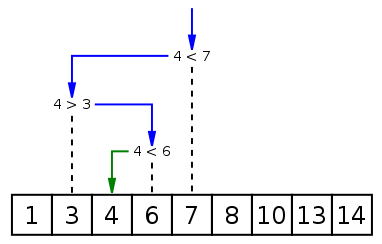 Other software using generative recursion are AST generators and the quick-sort algorithm among others. Diego Marquina 2017. Feel free to use the content of this site.